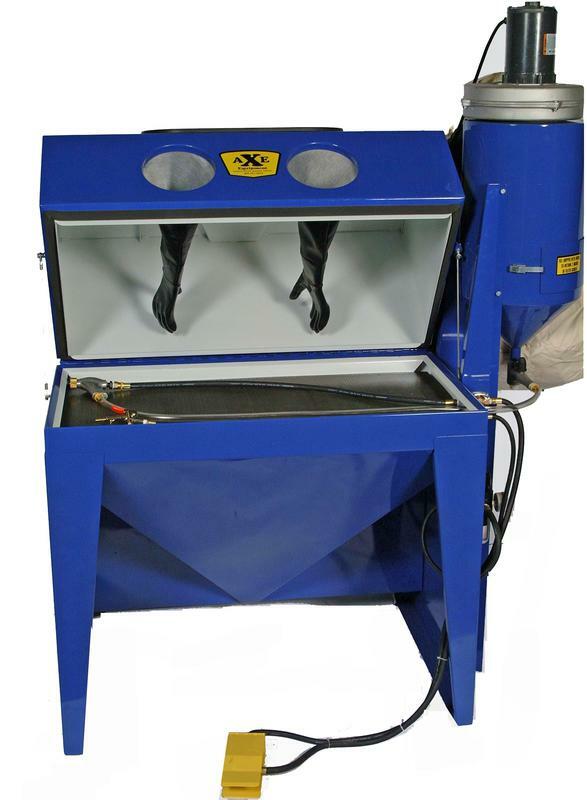 The AXE SL-46 Model is the finest bead blasting machine available in its price range. Our 450 cfm reclaimer is truly a cyclonic separator and not just a dust collector. work screen is supported with 90 degree braces for holding heavy parts such as cylinder heads etc. The SL-46 is designed with a foot pedal operated air control system sending blasting media to the aluminum pistol grip media gun for comfortable and precise cleaning, The work area also includes a built in air nozzle for the finishing details. As illustrated by the red arrows AXE Equipment goes the extra mile and adds a 45 degree brake inside the lip of the bottom shell for keeping any remaining media inside the cabinet and not on your floor. The heart of the SL-46 is the 450 cfm reclaimer that makes a big difference in speed and efficient cleaning. Media is cleaned on each pass by the reclaimer, broken beads, dust and fine particles are separated from the re-useable media and exhausted to the dust bag. 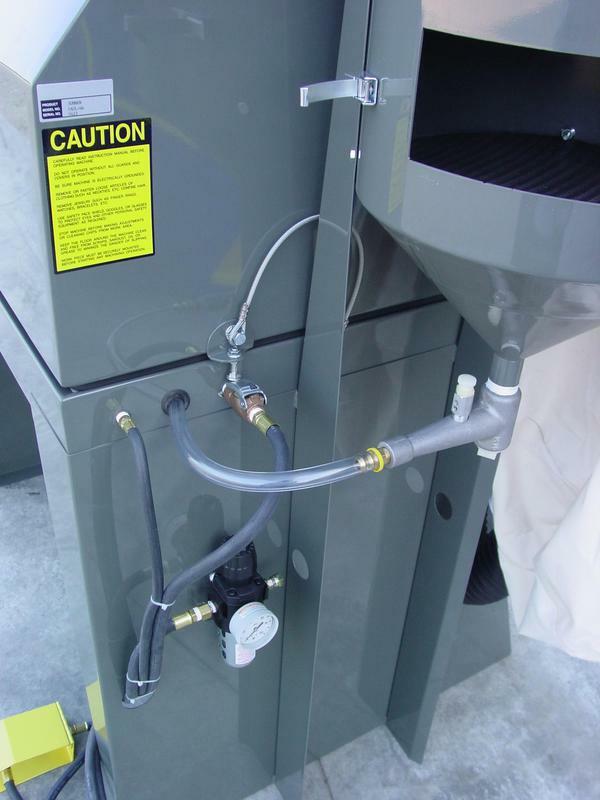 Larger particles are trapped on the secondary filter screen and the round re-useable media is returned to the storage hopper. The SL-46 sports a split level design enabling parts to be loaded and un-loaded quickly and easily. This heavy duty cabinet uses an all steel 14 gauge construction with a beautiful powder coated finish for years and years of productivity. So the user can view the work area with ease a large 10” x 24” double strength viewing glass with dual 24” fluorescent lighting is included. 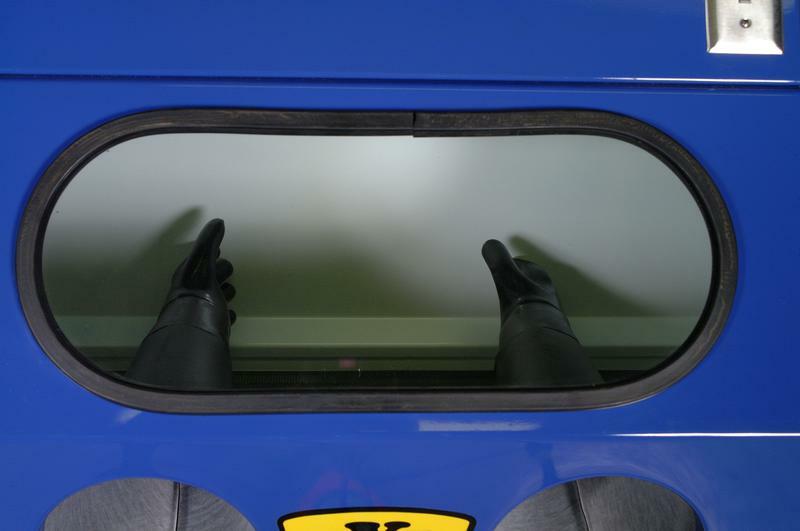 The SL-46 features a free air venturi concept that moves the free air over the light glass for continuous visibility inside the cabinet. The SL-46 includes a built in air regulator for precise air control to the media gun. 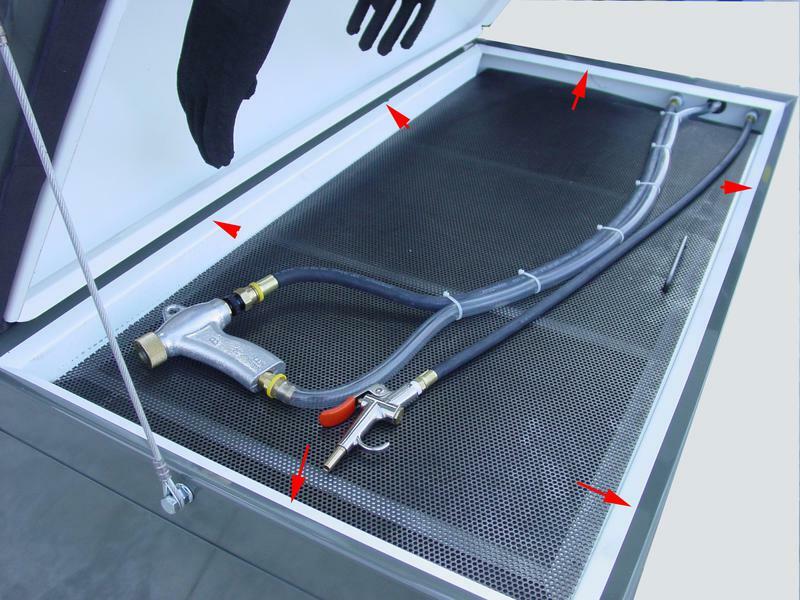 Attached also is the auto shut valve to prevent blasting media from exiting the cabinet in the event the lid is raised while the foot pedal is depressed. 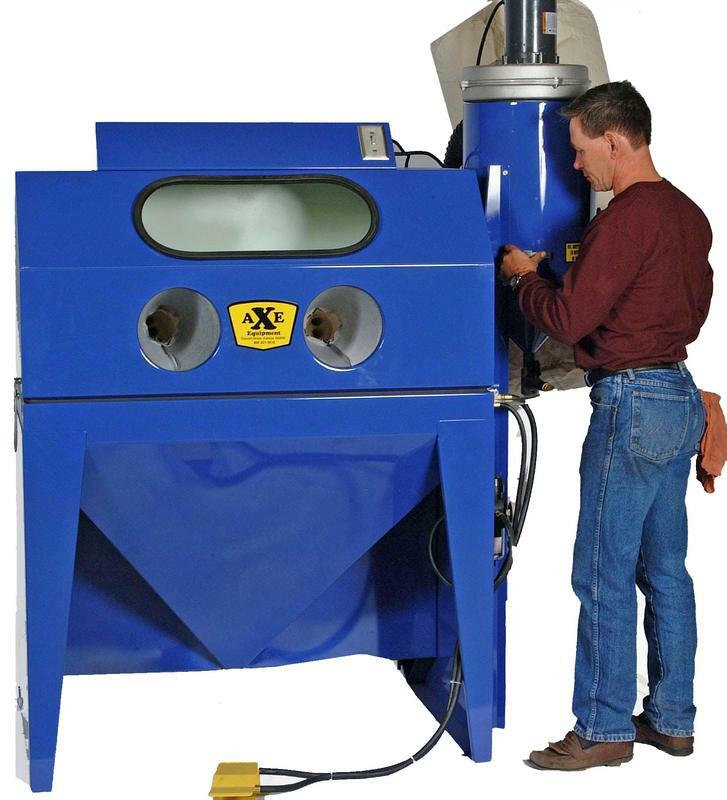 The opening on the hopper is where the blasting media is loaded and stored. 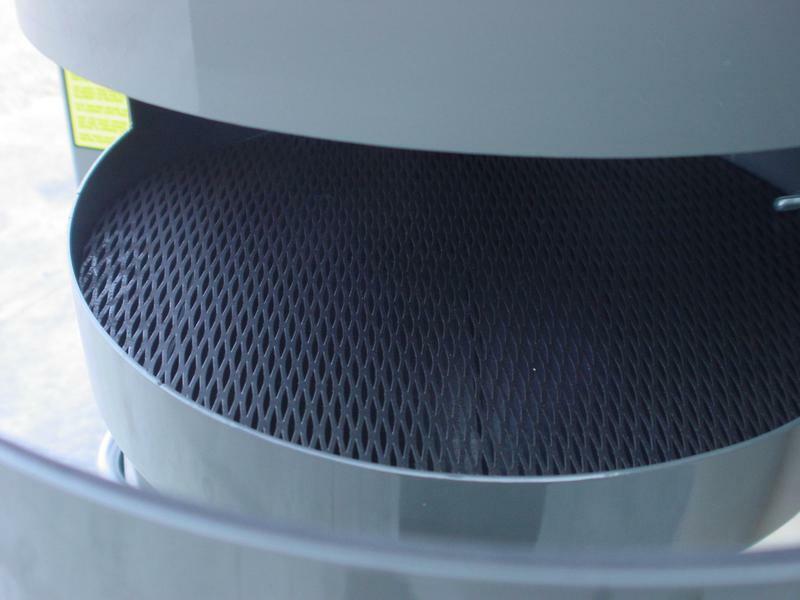 The hopper includes a removable secondary filter screen that traps large heavier debris such as silicone materials etc.